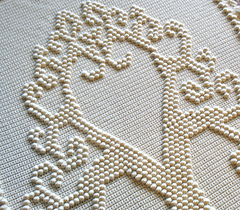 Get ready for wedding season with this sure to be treasured heirloom blanket. 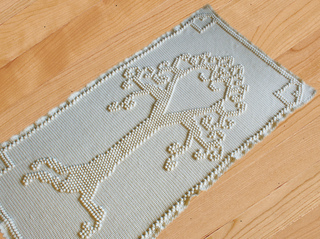 This tree of love afghan represents a family tree that continually grows with the passage of time and growth of love. Either made for a newlywed couple or a new addition to the family, this afghan can be passed down through the ages as the family tree grows. This beautiful afghan is the perfect size to fit the crib of a precious little one or rest on the couch or chair of a new couple. 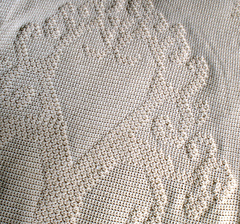 Made with single crochet and bobbles, this blanket is easy to work up. 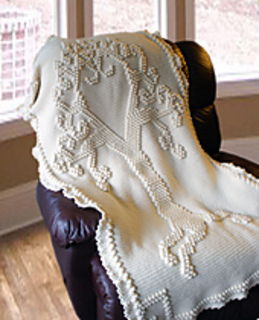 The afghan includes full written instructions as well as a diagram for visual crocheters. The last picture shows the backside of the afghan, so you can see what the bobbles look like on the wrong side (very pretty texture up close).